The fire tower at Chimney Rock National Monument, built in 1940 by the Civilian Conservation Corp, was torn down in 2010 because it interfered with viewing astronomical events connected to the site, such as the major lunar standstill. Under the tower’s foundation, archaeologists found a 1,000-year-old fire pit that may have been a piece of a vast communication system that linked ancestral Puebloan sites in the Southwest. In 2007, a group of researchers duplicated an experiment performed in 1990 by Kathy Freeman, a high school student from Farmington. Using large mirrors, researchers were able to signal to distant sites in the Southwest. They believe Native American tribes could have used large fires to achieve similar results. Carey Vacenti, assistant professor of sociology at Fort Lewis College and a member of the Jicarilla Apache tribe, says that according to Native American oral histories, fires were used to notify outlying settlements of Chaco Canyon that people from the south had arrived with goods to trade. Chaco flourished as a cultural center from the 800s to the 1100s. In 1933, President Franklin D. Roosevelt set about bringing the United States out of the Great Depression with his New Deal. These efforts included a number of things that became a part of everyday life, such as the ending of Prohibition, the establishment of Social Security and the creation of the Civilian Conservation Corp, which put unemployed men to work in a time when jobs were hard to find. In the Southwest, there are multiple example of projects taken on by the CCC, including the Lions Den shelter near Fort Lewis College, many of the trails and roads at Mesa Verde National Park and, until it was removed in 2010, the fire lookout tower at Chimney Rock National Monument. The lookout tower has quite the history: It was built in 1940, abandoned in the ’50s after it caught fire, reconstructed in 1987 for viewing the ancestral Puebloan site and ultimately removed because it interfered with the observation of astronomical events. What’s even more interesting, however, is the history of the ground on which the tower was built. Beneath its foundation is a 1,000-year-old fire pit that may have been a piece of a vast communication system that linked ancestral Puebloan sites in the Southwest. Linking distant sitesJulie Coleman, archaeologist and tribal liaison for San Juan National Forest, says archaeologists’ accounts from earlier excavations of Chimney Rock documented evidence of large fires. But there wasn’t a connection to long-range communication until 1990 when Kathy Freeman, a high school student from Farmington, conducted an experiment using large mirrors as part of a science fair project. Using mirrors, Freeman was able to reflect light from Chimney Rock to Huerfano Mountain, which is on protected Navajo Nation land in northern New Mexico. That land also has evidence of large bonfires. From Huerfano, light was relayed to Pueblo Alto in Chaco Culture National Historic Park. “It totally worked. You could see the flashes of the mirrors, and in 2007, we recreated that experience,” Coleman said. That experiment was more than a duplication of Freeman’s. 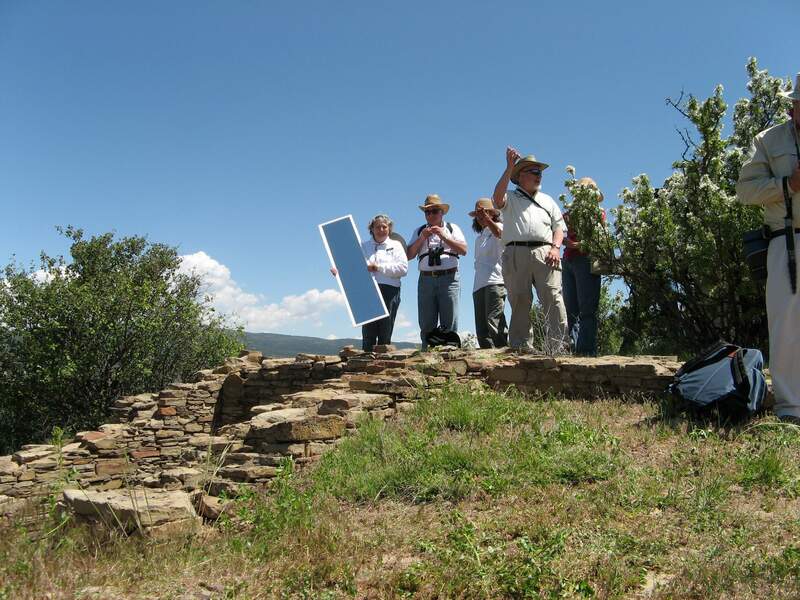 Researchers placed crews at a number of sites around the Southwest, including Aztec Ruins National Monument, the Far View site at Mesa Verde National Park and Salmon Ruins in Bloomfield. 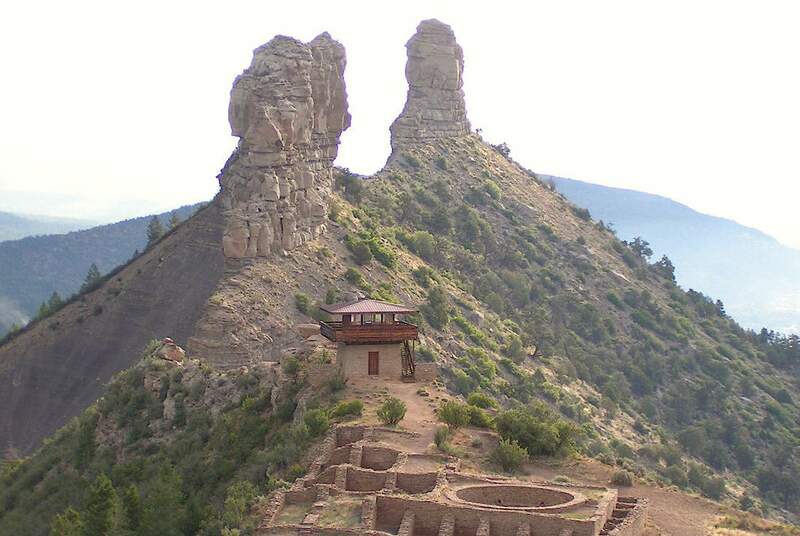 Using a similar methodology, scientists were able to connect many ancestral Puebloan sites in the area, but hazy conditions meant the connection between Huerfano and Chimney Rock was not achieved. While researchers used mirrors, it is believed that Native American tribes could have used large fires to achieve similar results. But what would such long-range communication have been used for? Commerce and moreColeman said archaeologists can only speculate, but a prominent belief is that fires were used to relay the timing of major celestial events, such as the summer and winter solstices and the northern major lunar standstill where the moon appears to rise between the two spires at Chimney Rock. While this is one possible reason identified by Western scholars for using fire to communicate across long distances, it isn’t the only one. The oral histories of tribes with a lineage to the ancestral Puebloans paint different pictures of the pueblos, how they interacted and why. Carey Vacenti, assistant professor of sociology at Fort Lewis College, is a member the Jicarilla Apache tribe and also has Pueblo and Southern Ute ancestry. Vacenti said the oral histories taught to him from his Pueblo lineage describe sites in the Southwest, particularly Chaco Canyon, in ways that non-Native Americans are not willing to accept because of the sentiment around oral accounts. “Much of the oral history is ignored by anthropologists and archaeologists because they consider it to be unreliable, and yet you learn the Pledge of Allegiance not probably by reading it but by reciting it, and nobody gets those words wrong,” he said. This is because scholars have to be able to corroborate these accounts with material evidence and interpret from there, Hovezak said, which can be difficult because of the number of Native American tribes affiliated with sites like Mesa Verde. “They all have their own take and their own history of this place,” he said. 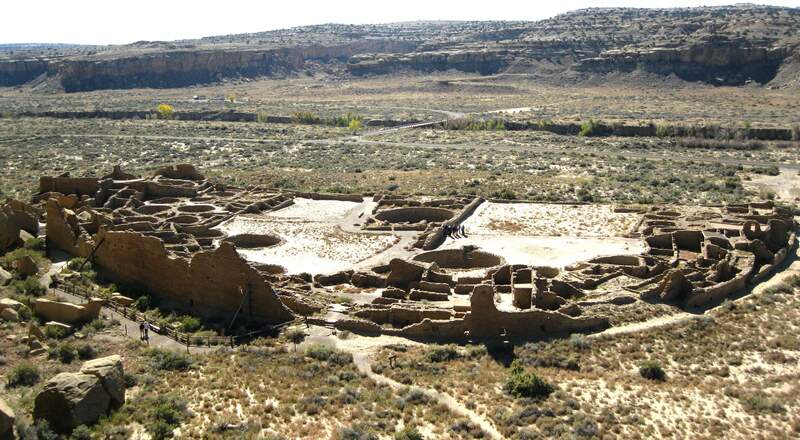 The histories passed down to Vacenti describe Chaco Canyon as a religious mercantile hub. The area flourished for more than 300 years beginning in the mid-800s A.D. “It was kind of the equivalent of a, what would you call it, like a religious bookstore. It’s kind of like you go to a religious bookstore and get all kinds of religious paraphernalia. You can get different types of bibles, you can get prayer beads … you can get things like that,” Vacenti said. This trade would include a number of items brought north from Central America, such as shells, copper bells, macaw feathers and chocolate. Vacenti said the long-range signaling system was connected with this trade, and fires were used to notify outlying settlements that people from the south had arrived, according to his oral histories. Manipulating landscapesAncestral Puebloans may have used fire for much more than long-range communication. Evidence suggests it was used as a tool for manipulating landscapes. Some sites in the region appear to have been ritualistically burned during their abandonment, Hovezak said in an email. But corroborating evidence is needed when attributing burning to the ancestral Puebloans because of the lack of a written record, he said. Without it, most fires at Mesa Verde are attributed to natural causes. George San Miguel, natural resources manager for Mesa Verde, said there is evidence that points to a broader use of fire at the national park. According to a study published by San Miguel in 2013, there is a significant rise in charcoal accumulation at the park during the peak of habitation by ancestral Puebloans with a decrease after emigration from the area. The study goes on to say this would be the first instance of extensive fire use by ancestral Puebloans in the Southwest, but this isn’t particularly a surprise based on Native American’s history of environmental manipulation through fire. “This is not shocking or anything like that,” San Miguel said. Perhaps the most prominent example of Native American use of fire is in the Southeast where slash-and-burn practices were used to clear land for farming before colonization. There are a number of other accounts of fire use by Native Americans, including hunting and herding of buffalo in the Great Plains, as well as a list of logical reasons for its use. San Miguel said fire could be selectively used to keep vegetation in particular growth stages when it is more nutritious and allow for the support of more game animals in an area for the purpose of hunting. Fire could also be used to manufacture an expanded “edge effect,” the area where two ecosystems meet, such as the joining of plains and a forest, where there is increased biodiversity. It could also be used to essentially groom an area, removing underbrush and easing travel and hunting within it. Without a written record, it is hard to say exactly why fire use was expanded during the settlement of Mesa Verde. “This is speculation. We don’t know this for fact, but these are logical reasons to do this kind of thing,” San Miguel said.